The last few days while the pre-set posts have ticked over on IADW, I have been trapped at home 'resting', after undergoing surgery. 'Cool' doesn't describe it. 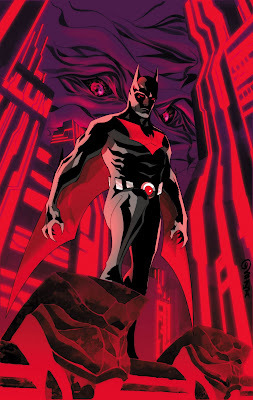 After years of future gazing, hit animated series Batman Beyond finally gets it's own 'general audience' comic this June - granted it's only a 6 issue mini - but what a mini it could be. While it's a bit of a leap from the shows sleek 'Bruce Timm' illustration style, to the more ripped look shown by cover artist Dustin Nguyen, Dustin always delivers and here is no exception. Picking up on the core visual trait of the source material, the cover balances a strong futuristic neon look, with the classic 'vibe' of Gotham, and it's need for a 'Dark Knight'. Hell, it reminds me of why I used to chuck the DVD on, just to see the opening credits! Thanks for that Rob! Almost back to 100% again! Yeah timing is a bit delayed for BB isn't it? Maybe just the production values are incredibly high!